At Bowsland Green we are committed to ensuring that our learning environment is the best that it can be. Our squad made a fantastic start last year by developing our conservation area and introducing a reward system for the class with the best learning environment. 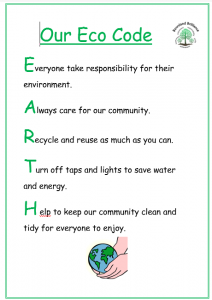 We hope that we can build on their hard work and continue to work alongside our staff and children to make our environment as exciting, forward thinking and as sustainable as it can be. We will be updating our page regularly so keep watching this space! Hello and a big warm welcome from Bowsland Green’s Eco Squad! We are trying to make our world an even better place, so please keep an eye on our page to explore what we have been up to. We know that we might not achieve all of these, so we will choose our favourites and work hard to achieve them! If you want to help make a difference, you can recycle or make old things great again! Have a look at our upcoming post to see one idea of how! Also, make sure you put rubbish in the bin, as lots of animals are being hurt by the amount of plastic that ends up in the sea! I’m a member of the Eco Squad! I worked really hard to make these puppets out of a cardboard box that one of my toys came in. I made these out of card, tape and a straw. I cut out the figure from the bow and attached the straw on the back with tape. I really enjoyed playing with them with my friends and finding ways to reuse old, unwanted things! This is just one of the ways that you could reuse your unwanted things! How many ways could you think of? More recycling needs to be carried out in classes. Some rubbish was found in school grounds. More use of outdoor learning in our conservation area and more coverage needed of environment issues within our curriculum. Last week, Eco Squad worked together as a team to collect enough sticks to make Christmas decorations – we now have enough sticks to supply the next 3 years of decorations! We then came back together and made them into different festive shapes! We had a lot of fun and were extremely proud of the results! Take a look for yourselves!